Home » Website Building » SEO » How to Submit Sitemap to Yandex Webmaster Tools? Sitemap is a tool to inform search engines and users about the structure of your site. It helps to navigate the site easily and understand the importance of any particular page compared to the whole site. There are two types of Sitemaps – one is a HTML Sitemap and the other is a XML Sitemap. HTML Sitemap is a simple webpage intended to guide the human users while the XML Sitemap is the for guiding search engine crawlers. In this article we will explain how to submit Sitemap to Yandex search engine through Yandex Webmaster Tools account. Webmasters can submit their Sitemap to Yandex search engine only through Yandex Webmaster Tools account. In order to add a Sitemap, you must have added and verified your site successfully. You can check out the separate article explaining how to register and verify your site with Yandex. Once you have successfully added your site in Yandex Webmaster Tools account, navigate to “Sitemap files” tab under “Indexing” section. 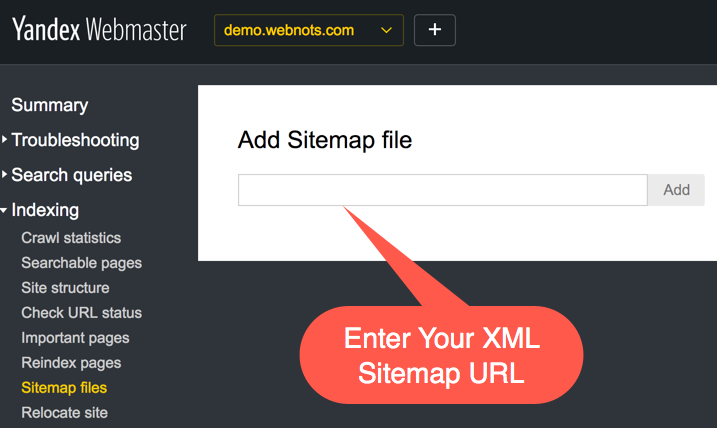 Enter your XML Sitemap URL in the box and click on the “Add” button to submit your Sitemap. Ensure to submit the correct version of http or https and with or without www in the URL. Once submitted, you will see the status as “Processing queue“. 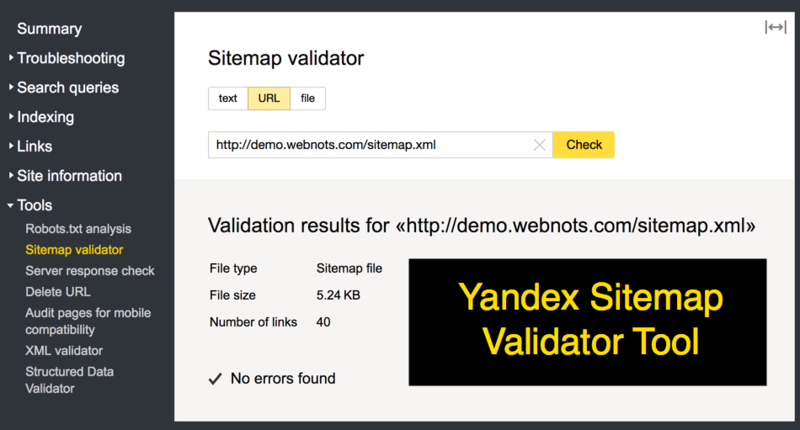 Yandex accepts XML and Text Sitemap formats. It may take few days time for Yandex bot to crawl your Sitemap and then the status will be changed to OK.
Yandex does not provide an option to resubmit your Sitemap, hence in order to submit a new Sitemap you need to first delete the existing one and then submit a new one. You can delete the Sitemap any time by clicking on the “X” button next to the Sitemap. It may take up to two weeks for Yandex to process the new version of your Sitemap. The easy way is to enter the XML Sitemap URL and click on the “Check” button to get the results of the validation. The “Sitemap validator” is available under the sidebar menu “Tools”. You can also access the validator from the “Tools” menu from the top navigation bar. Yandex will not index your XML Sitemap URL in order to avoid the Sitemap showing in the search results. The submitted URL will be excluded from the search by default. You can view this information under “Indexing > Searchable Pages > Excluded Pages” section . Thanks for the post! Very helpfull! With the help of your step by step instructions, I submit my XML sitemaps to my two sites.